The Haralson apple tree fares well in cold climates. Developed in the 1920s by University of Minnesota agricultural researchers, this apple tree's hardiness has made it popular with both commercial and home orchard growers. The trees produce tangy apples suited for eating fresh and baking. The Minnesota Agricultural Experiment Station (MAES) at the University of Minnesota developed the Haralson apple tree and released the variety in 1922. 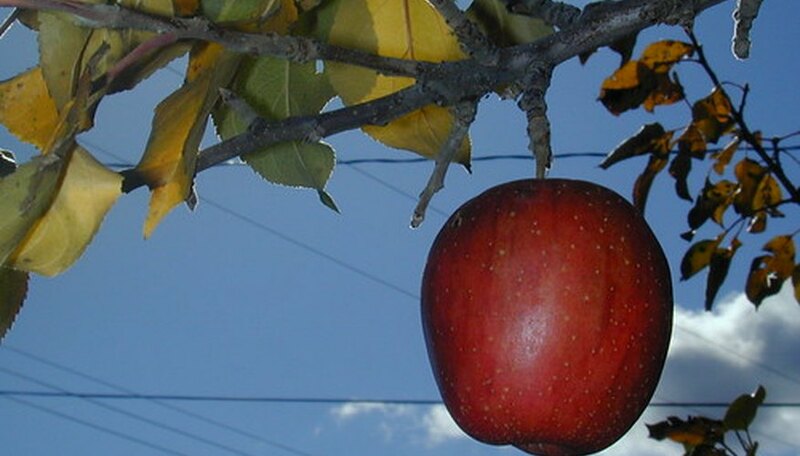 The Haralson apple tree was one of the first of several apple varieties that the MAES developed as part of a program to find varieties that could survive Minnesota's extremely cold winters and hot, dry summers. It is named after Charles Haralson, who was director of the research station during the early 20th century. The Haralson apple tree is hardy to U.S. Department of Agriculture Zone 3. The trees will grow to 20 feet to 25 at maturity. Because the Haralson apple tree is a biennial fruit bearer, it generally yields a heavy crop one year and a lighter crop the next. Haralson apples are bright red, medium-sized fruits that have a firm texture and a tart flavor. They ripen in late September through early October. The MAES says that Haralson apple trees, like most standard-size fruit trees, require five to seven years of growth before they will produce fruit. To get the maximum benefit from your trees, plant them where they will get at least eight hours of direct sun daily. You should also follow a regular pruning and disease and pest management program. Haralson apples trees are low-vigor, easily trained trees, which means they can be pruned to a lower height for ease in harvesting. In addition to chill conditions, Haralson apple trees resist apple scab and cedar-apple rust, both fungal diseases. The apples can develop water core, a disease in which portions of the fruit become water-logged, and russeting, which is characterized by rough, discolored spots on the apple's skin. Haralson apples are suited for eating fresh or for baking. The MREC says they are a great choice for making apple pie, and they also can be used to make apple sauce or cider. These apples also stay fresh for up to six months if they are kept refrigerated. Haralson apple trees are the parent trees of some newer, popular varieties of apple trees, including the Honeycrisp and the Honeygold. Both those varieties are products of MAES research. NDSU Extension Service: Varieties Fruit Trees.